The PEARL Information Session was held on the 25th August, 2018. Approximately 300 participants, including high school students, their families and professors joined us. 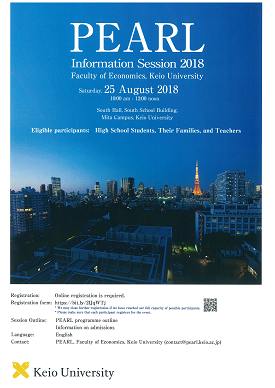 The Faculty of Economics at Keio University will hold an information session for the PEARL programme. This information session offers you the opportunity to learn more about us. We may close further registration if we have reached our full capacity of possible participants. Please make sure that each participant registers for the event. The session will be conducted mainly in English.